mGluR, metabotropic glutamate receptor; AR, adrenergic receptor; TRHR, thyrotropin-releasing hormone receptor; GnRH, gonadotropin-releasing hormone receptor; CCR, chemokine receptor; SSTR, somatostatin receptor. lated adenylyl cyclase activity. Furthermore, pretreatment of membranes with isoproterenol protected the dimer from the disruptive effects of the TM-VI peptide, suggesting that agonist treatment resulted in dimer stabilization (14). These studies suggest a role for TM-VI in P2-AR dimer formation and are consistent with a role for this domain, as proposed by correlation mutational analysis (13). Similarly, the TM-VI domain of the leukotriene B4 receptor BLT1 was shown to be involved in dimerization because a TM-V1 peptide inhibited the dimerization of this receptor and affected its ability to interact with heterotrimeric G proteins (12). In contrast, in the case of the D1 dopamine receptor, the peptide corresponding to TM-VI did not disrupt oligomer formation; however, it caused a dose-dependent irreversible inhibition of antagonist binding and attenuation of signaling (15), suggesting a role for additional TMs in the dimerization of this receptor. In the case of D2 dopamine receptor, an elegant set of cysteine crosslinking studies was used to identify TM-IV as a symmetrical dimer interface for this receptor. Additionally, this study showed that crosslinking did not affect ligand binding or receptor activation, suggesting that D2 dopamine receptor forms a constitutive dimer (16)We investigated the role for TM-V to -VII domains in dimerization of 5-opioid receptors using synthetic peptides to the putative TM domains. For this, peptides were incubated with immunoprecipitates obtained from cells co-expressing Flag-5 and myc-5 receptors, and the level of monomers released into the supernatant as well as the dimers left behind in the pellet were examined as described (see Fig. 1 legend). We discovered that the level of dimers present in the pellet was reduced by greater than 80% upon treatment with either TM-V or TM-VI peptide (Fig. 1A). There was little (approx 25%) and no change with the TM-VII and mutant TM-VI peptide, respectively (Fig. 1A). The decrease in the level of dimeric receptors matched well with the increase in the level of monomers (Fig. 1B) observed in the supernatant. These results suggest a role for TM-V and -VI in the formation of 5-receptor dimers, although the involvement of additional TMs cannot be ruled out. Fig. 1. Effect of various peptides on 8 receptor dimerization. Human embryonic kidney (HEK)293 cells were transfected with myc-tagged and Flag-tagged 8-recep-tors. Immunoprecipitates with anti-myc antibodies were incubated with vehicle (control) or with 1 mM peptides corresponding to TM-V(217VFLFAFVVPILIIT VCYGLML237), TM-VI (263VLVVVGAFVVCW APIHIFVIV283), TM-VII (297VAALHLCIALGYANSSLNPVLYAF320), or TM-VI mutant (263VaVVVaAFVa CWAaIHIaVIV283) in a buffer containing a protease inhibitor cocktail for 1 h, as described in ref. 14. The mixture was centrifuged and the resulting pellet (A) and supernatant (B) fractions were separately subjected to SDS/PAGE and Western blotting with anti-Flag antibody as described in ref. 14. The autoradiograms were analyzed by densitometry and the density of the vehicle band was taken as 100%. Data represent mean ± SEM of three independent experiments. tion of a normal binding site (18). Co-expression of mutant somatostatin receptors lacking the second extracellular loop (and ligand binding) with mutants lacking the C-terminal tail (and signaling) led to the reconstitution of agonist-mediated signaling (19). Studies with a1b-adrenoreceptors containing a fused Ga11 at the C-terminus demonstrated that co-expression of two nonfunctional, but complementary, fusion constructs led to reconstitution of agonist-mediated signaling (20). Similar observations were made with mutant fusion constructs of the histamine H1 receptor (20). These and additional studies using G protein fusion constructs are described in detail in Chapter 12. Interestingly, cotransfection of a mutant human platelet-activating factor receptor, which does not couple to G proteins (and therefore does not exhibit agonist-mediated increases in inositol phosphate), with the wild-type receptor led to the formation of a constitutively active receptor that exhibited a higher production of inositol phosphate than the wild-type receptor (21). 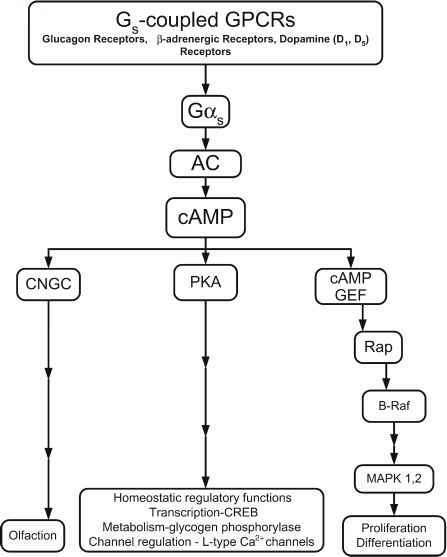 Functional complementation studies have also demonstrated a partial reconstitution of signaling. In the case of the calcium-sensing receptor, cells co-expressing cysteine to serine mutants—each with reduced (or absent) agonist-mediated, calcium-dependent signaling—exhibited partial reconstitution of signaling (22). In the case of CCR2b chemokine receptors, cotransfection of a loss-of-function CCR2 (Y139F) mutant receptor with the wild-type receptor led to a decreased affinity and responsiveness to agonists (23). Additionally, co-expression of truncated mutant chemokine CXCR2 receptors that did not exhibit agonist-mediated signaling with the wild-type receptor resulted in impaired agonist-mediated signaling and chemotaxis (24). Cotransfection of mutant vasopressin V2 receptors (truncated by the introduction of a stop codon into either the i3 , i2, or e2 loop) with the wildtype receptor led to a decrease in maximum binding and agonist-stimulated cyclic adenosine monophosphate (cAMP) levels (25). Similarly, an attenuation of agonist-mediated signaling efficiency was observed after co-expression of a dominant interfering mutant of the a-mating factor receptor STE2 with the wild-type receptor (26). This did not result from G protein sequestration, because the effect was observed even after overexpression of G proteins (26). Additionally, co-expression of an endocytosis-deficient mutant receptor with the wild-type receptor led to efficient receptor internalization, suggesting that dimerization plays a role in agonist-mediated endocytosis of the a-mating factor receptor (26). The physiological consequences of receptor dimerization have been illustrated in studies using natural variants and/or mutants of GPCRs (27,28; see Chapter 14). In the case of the melanocortin-4 receptor, researchers have observed that a D90N mutant receptor initially isolated in a patient with severe early onset obesity is highly expressed at the cell surface and binds agonist with the same affinity as the wild-type receptor, but it exhibits a complete loss of Gs-mediated adenylyl cyclase activation. Cotransfection of this mutant receptor with the wild-type receptor leads to suppression of agonist-mediated cAMP stimulation, and this is dependent on the amount of mutant receptor transfected (27). Studies with other GPCRs have shown that co-expression of naturally occurring deletion or truncated mutants that exhibit decreased agonist-mediated signaling with wild-type receptors leads to a significant decrease in surface expression and agonist-mediated signaling of the wild-type receptor (28; see Chapter 13). These functional complementation studies, which resulted in reconstitution, increased, or decreased binding or function of wild-type receptors, suggest that dimerization plays a major role in modulation of receptor activity. The fact that ligands significantly modulate the dimerization of other membrane receptors, such as the tyrosine kinase receptors, raised the issue of whether ligands can modulate GPCR dimers. Studies have found that ligand treatment leads to no change or an increase or decrease in the level of receptor dimers. Increases in the level of receptor dimers following agonist treatment have been observed with a few GPCRs, such as the P2-AR (14). Receptor isolation by affinity chromatography, followed by nonreducing sodium dodecyl sulfate-polyacrylamide gel electrophoresis (SDS-PAGE) and Western blotting with an antireceptor antibody, led to the isolation of both monomeric and dimeric forms of the P2-AR (14) as well as the m3 muscarinic receptor (29), suggesting that both monomers and dimers could bind ligand. Treatment with the agonist increased and with the inverse agonist decreased the amount of dimers of P2AR, suggesting that agonists stabilized the dimeric species of the receptor, whereas inverse agonists stabilized the monomeric species (14). These results are consistent with data from bioluminescence resonance energy transfer (BRET) studies in which agonist treatment led to an increase in the BRET signal, which was blocked by the selective antagonist (30). Agonist treatment also led to a dose- and time-dependent increase in BRET signal in the case of the thyrotrophin-releasing hormone receptor (31,32). Interestingly, in the case of the melatonin MT2 receptors (but not MT1) agonists, neutral antagonists and inverse agonists were able to induce an increase in the BRET signal, suggesting that receptor occupancy is sufficient to modulate the proximity of dimers (33). In the case of the bradykinin B2 receptor, crosslinking studies showed that treatment with the agonist bradykinin, but not a selective antagonist, led to an increase in receptor dimers (17). Agonist treatment was also shown to induce dimerization of the chemokine CXCR4 and CCR2b receptors (23,34). An interesting study with the gonadotropin-releasing hormone receptor used a bivalent antibody against the antagonist; treatment with this antibody in combination with the antagonist promoted receptor signaling. This led the authors to suggest that the antagonist-bivalent antibody complex induced receptor activation by bringing two receptor proteins to close proximity (35). More recently, using fluourescence resonance energy transfer and BRET techniques, researchers have shown that agonists, but not antagonists, can cause increased oligomerization of this receptor (36-38). Similarly, in the case of CCR2b receptors, it was shown that a bivalent agonistic antichemokine receptor monoclonal antibody induced receptor dimerization, whereas monovalent Fab fragments did not (23). In several cases, ligand treatment did not lead to alterations in the level of receptor dimers, suggesting that these were constitutive dimers. This result was observed with the m3 muscarinic receptor, in which the level of dimers was not significantly affected by treatment with the agonist carbachol (29). Similarly, agonist treatment did not significantly alter the level of dimers for the calcium sensing (39), sphingosine-1-phosphate (40), mGluR5 (41), neuropeptide NPY1 (42), chemokine CXCR2 (24), and chemokine CCR5 receptors (43). In the latter case, however, a bivalent antibody, which bound to the second intracellular loop, promoted micro-aggregation of preformed receptor homodimers (43). In the case of a few GPCRs, agonist treatment led to a decrease in the level of dimers, with a corresponding increase in the level of monomers. This was observed for the oxytocin (44), rhesus neuropeptide Y Y4 (45), and 5-opioid receptors (46). In the case of 5-opioid receptors, it was observed that only agonists that induced receptor internalization caused receptor monomerization. 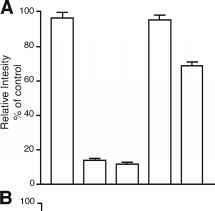 This suggests the involvement of an agonist-mediated decrease in the level of receptor dimers in agonist-mediated endocytosis. In summary, these studies show that in some cases, agonist treatment can modulate the level of GPCR homodimers. Note that current techniques do not allow us to distinguish between ligand-mediated association of monomers into dimers and ligand-mediated changes in the conformation of dimers (which would appear as an increase in dimer levels). However, in the majority of cases, the level of GPCR homodimers is unaffected by agonist treatment, suggesting that these receptors generally exist as constitutive dimers.